Vintage Oaks Horse Farm offers summer pony camps to riders of all ages and skill levels. In addition to daily riding lessons, campers will also learn the finer points of grooming and tacking up their horses. 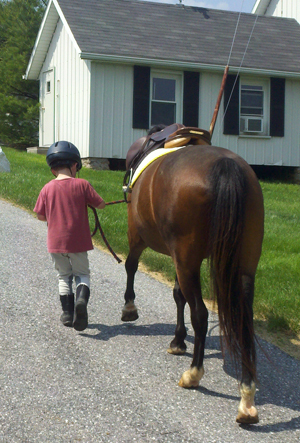 Horse care and safety lessons are also part of the curriculum. Each week there will be a variety of special activities that may include demonstrations by veterinarians, farriers, equine dentists and miniature horse and carriage driving. Other activities include trail rides, swimming and pizza and ice cream parties every Friday. *Kids in all camp weeks will be split in age appropriate groups for certain daily activities. • Horses will be shipped to the park for a day of riding cross country with size appropriate jumps. For more information, please contact us at 443-310-0315 or 717-676-2355.